that christmas feeling even nog goed nakijken !!!!!!!!!!!!!!! "Silver Bells" was written for the film, "The Lemon Drop Kid," in which it was sung by Bob Hope and Marilyn Maxwell. Prior to the film's release, however, a recording was made by Bing Crosby together with Carol Richards. 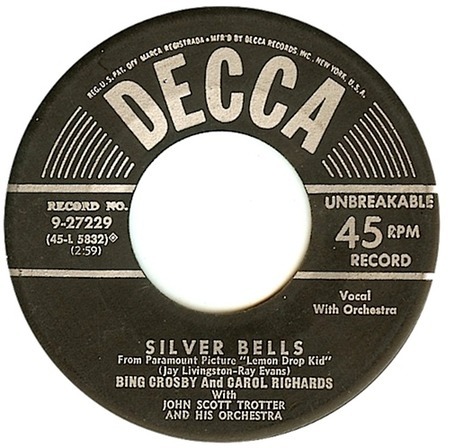 Always on the look-out for a new Christmas standard, Bing Crosby picked up on "Silver Bells" and got in touch with Carol Richards to record the number with him. Their original version was released in October 1950 as a single on Decca 9-27229 and became such a success that the scene in which it was featured in "The Lemon Drop Kid" was re-shot in a more elaborate fashion and the publicity for the film emphasised the inclusion of the number. The original title of the song was "Tinkle Bell," but when it was realized that the word "tinkle" was slang for "urination," a hasty rewrite was called for.